It's 9AM. I woke up so early today. 6 AM to be exact. I know, for some, that's not early. Everyone else must have already ticked off a dozen in their to-do list, while I was still battling with my other self if I should already get up from bed or not. haha! Since I'm up early, I'm hungry early, too. [weird sentence there, but I know you get my point :)] Anyway, I've been craving pancakes since last night. The photos at Spot.ph's list of top 10 pancakes in town didn't help. I was practically salivating at the layers upon layers of pancakes that were featured. Upon reaching the end of the list, I was sad to find that my favorite pancake of all time didn't make it: Blueberry pancakes from Bag of Beans Tagaytay. The first time I tried it, it was love at first bite! Imagine sinking your teeth into three humongous layers of blueberry-filled pancakes, smothered with blueberry jam and topped with whole berries and butter. Two slices of citrus adorn your plate of blueberry goodness. Pour syrup, and you're on your way to heaven! 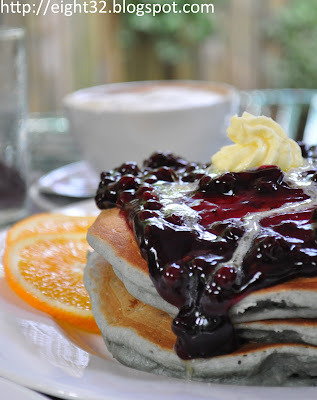 For just PHP195, the pancakes can serve up to four hungry tummies. Reasonable, right? And here it is. Tada! Haay. What would I give to have these right now? Osy naman!!! I love blueberry pancakes too. Now I'm craving for this. At dahil dyan we have to go there on our meeouting. haha! Tita, dinamay ata kita sa cravings ko. hehe! isasama na ba natin sa itinerary ng meeouting ang Bag of Beans? Yey!